Habitat loss is the single biggest factor affecting wild animal populations in North America. As the human species continues to grow and we continue to encroach on bear habitat, conflicts between bears and humans are on the rise. Collisions with cars, raiding garbage cans, eating rodents killed by poisons, haunting campsites, and even displaying aggression towards humans and their pets can all land bears in trouble. And all the above also result in the death of adult bears, intentional or otherwise. There are over 600,000 black bears, over 50,000 brown bears (grizzlies and kodiaks are both brown bears) and about 11,000 polar bears living in North America. “By the time a bear is 3 or 4 if it has learned to break into garbage cans, it’s going to continue to do that,” Nanci Limbach, the executive director of a bear rehab facility in Colorado told CBS. Bear rehabilitation efforts focus on cubs and yearlings. Bear rehab is currently in the news because a grizzly bear mother killed and ate a hiker in Yellowstone. Her two cubs presumably fed on long pig as well, so after the National Park decided to euthanize the mom, they sent the bears to live in the Toledo, Ohio zoo rather than rehabbing them. This has caused widespread outrage in bear lover circles. When it has been determined by wildlife officials that a cub has been orphaned (after 48 hours of monitoring and giving every opportunity for the sow to return for her cub), the cub is captured and admitted to ABR. If the cub is over 5 pounds in weight, it is immediately placed on a commercial formula, bottle or bowl-fed every 3-4 hours, and housed with other cubs for comfort and companionship (offering a minimum of human contact). 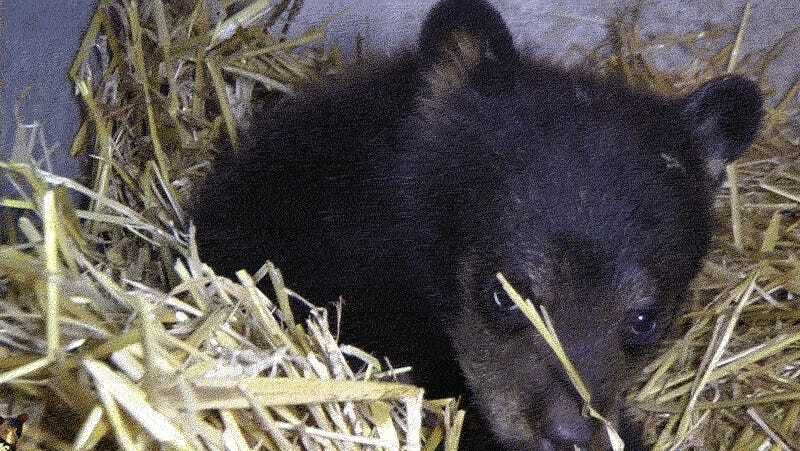 If the cub weighs under 5 pounds, wildlife officials immediately begin the search to find a suitable surrogate mother in the wild while the cub receives care at ABR’s facility. If a cub can be reintroduced to the wild immediately with a surrogate mother and siblings, the process moves quickly. If not, the cub is raised at ABR’s facility for later release to the wild. Cubs arriving at ABR’s facility in the spring are weaned by June and introduced to a 1/2-acre bear enclosure which offers numerous hardwood trees, natural dens, and man-made streams and water sources (pools). Upon introduction to the bear enclosure, the cubs no longer see humans or receive any human contact (unless medical attention is required). The enclosure’s fence is covered with an 8’ black blind which blocks the cubs’ view of humans or unnatural sights. Food is tossed over the fence and scattered so the cubs must forage in a natural manner. The cubs’ diet consists of fruits, berries, nuts and some vegetables that are similar to the natural diet they will find in their wild habitat. Guidelines from TWRA (Tennessee Wildlife Resources Agency), state that bear cubs must weigh at least 50 pounds before they can sustain themselves in the wild. ABR’s procedure is to make sure the cubs have attained that weight and that they also exhibit normal foraging behavior, interacting/vocalizing with other cubs and climbing skills. The cubs should exhibit positive bear behavior by staying in the trees during the day and descending to eat at night. If the cubs are moving around for short periods of time during the day, they should immediately retreat to the trees when they hear unusual noises or smell unusual odors. The goal at ABR is to make sure bears don’t want to associate with people on any level. During their months in residence with no human contact, the cubs are naturally cautious and afraid of people and retreat to the trees for safety if they hear humans or strange sounds. This is the reason ABR does not have visitors. How And Where Are Bears Re-Introduced Into The Wild? The “where” is the big question. There exists a complicated arrangement of laws and agreements that govern where bears can be released, geographically. Typically, those dictate that a bear from a certain state can only be released in that same state. Or, that a bear found in a National Park, must be released in that same National Park. This is made complicated by the fact that bears can be shipped across state lines to reach a rehab facility and by the fact that many of those facilities are private, rather than government entities. Those regulations seem to exist more to make release of the bears as easy as possible than they do to ensure the bears go to remote areas. The thinking there is to make release a routine affair, rather than something where each release is subject to bureaucratic red tape or local politicking. But, obviously the goal is to find an area where the newly rehabbed teen bears can enter an environment where they can successfully find food and habitat, where the bear population is not overcrowded and also where human conflict will be minimized. How the bears are released is also a factor in their success. The cubs are trapped and put in small holding areas. When officers arrive at the ABR facility to prepare the cubs for transport, the cubs are darted with a mild sedative to allow approximately 30 minutes for a final health check and to measure/weigh them. During this final exam, the cubs are given numbered ear tags and lip tattoos for identification purposes. The cubs are not aware of any of these procedures while they are sedated. Then, the cubs are loaded in a bear box for transport. We normally try to release the cubs in pairs, although there is no scientific data that supports the idea that the cubs stay together in the wild. Bears are ordinarily solitary animals except during breeding season or where food sources are concentrated and abundant. Though they may have enjoyed the interactions of being with other cubs while at ABR, their natural instincts tell them to make their way in the wild alone. In Colorado, bears are fattened enough to facilitate a good hibernation, then wildlife officers wait until they go to sleep for the winter before releasing them. To do that, they build an artificial den at the release site and transfer the bears to it. The bears simply wake up in their new habitat. Other methods involve “hazing” to really drive the bears’ natural fear of humans home. Washington, for instance, has a successful program in which it employs the incredible Karelian Bear Dog to chase bears away from release sites, instilling a permanent association of scary ninja dogs with human presence in all released bear. Washington and other states also use rubber bullets to achieve the same effect. Can Bears Really Go Cold Turkey? And that hazing works. Washington says it has an 80 percent success rate. Eight out of ten bears that have KBDs pursue them post-release never again get into conflict with humans. In its 180 releases, Appalachian Bear Rescue has had none of its released bears reported as “garbage” or “nuisance” bears. “I know 70 different bears that I’ve worked on and of those I only know four that we have known fates on,” Colorado wildlife officer John Broderick tells CBS. The other 66 are presumed to have been successful. But, these are wild animals and their fates are far from certain. So why weren’t the Yellowstone cubs enrolled in a rehab program? Simply money and availability of rehab programs, the Park’s superintendent Dan Wenk told National Geographic. “Believe me, had it been a ready viable option, I would have seriously considered it,” Wenk told the magazine. No grizzly bear rehab program exists in the continental United States and transporting a bear across international borders, even Canada’s, is fraught with regulation. Capturing, transporting and rehabbing a bear each costs thousands of dollars. Cumulatively, that same amount of money could achieve greater pro-bear benefits if spent elsewhere. Money that would have saved those two cubs can instead be spent purchasing grazing rights on public lands back from farmers, eliminating potential conflict across much of Yellowstone’s 800+ bear population. For some bears, rehab is simply too expensive.